Christ’s glorification consists in his Resurrection and his Exaltation in heaven, where he is seated at the right hand of the Father. The general meaning of Christ’s glorification is tied to his death on the Cross. Just as by Christ’s Passion and Death, God abolished sin and reconciled the world to himself, so likewise, by Christ’s Resurrection, God inaugurated the life of the future world and put it at mankind’s disposition. The blessings of salvation stem not only from the Cross, but also from Christ’s Resurrection. These fruits are applied to men through the Church’s mediation and the Sacraments. Specifically, through Baptism, we receive pardon for our sins (both original sin and personal sins) and are clothed in the new life of the Risen One. The glorious exaltation of Christ comes about through his Ascension into heaven, which took place forty days after his Resurrection (cf. Acts 1:9-10), and his glorious enthronement in heaven, to share as man the Father’s glory and power, and to be Lord and King of creation. With the Ascension, the mission of the Redeemer—the sending of Christ among men in human flesh to bring about their salvation—comes to an end. After his Resurrection, Jesus continued his presence among us so as to manifest his new life and complete the disciples’ formation. But this presence ends on the day of the Ascension. However, when he returns to heaven to be with the Father, Jesus nevertheless stays with us in other ways, principally in a sacramental manner through the Holy Eucharist. The Ascension is the sign of Jesus’ new condition. He goes up to heaven to share the Father’s throne, not only as the eternal Son of God, but also insofar as he is true man, the victor over sin and death. The glory that he had bodily received with the Resurrection is now completed with his public enthronement in heaven as Sovereign of creation, alongside the Father. Jesus also receives the homage and praise of the blessed in heaven. Since Christ came into the world to redeem us from sin and lead us to perfect communion with God, his Ascension inaugurates humanity’s entrance into heaven. Jesus is the supernatural Head of mankind, as Adam was in the order of nature. Since our Head is in heaven, we who are his members have the real possibility of reaching heaven too. Moreover, he has gone to prepare a place for us in the Father’s house (cf. Jn 14:3). Seated at the right hand of the Father, Jesus continues his ministry as universal Mediator of salvation. “He is the Lord who now in his humanity reigns in the everlasting glory of the Son of God and constantly intercedes for us before the Father. He sends us his Spirit and he gives us the hope of one day reaching the place he has prepared for us” (Compendium, 132). b) Impels us to live by faith, since we know that we are accompanied by Jesus Christ, who knows and loves us from heaven and who continually gives us the grace of his Spirit. With God’s strength we are able to carry out the apostolic work entrusted to us, and help bring all souls to him (cf. Mt 28: 19) and place Christ at the summit of all human activities (cf. Jn 12:32),so that his Kingdom might become a reality (cf. 1 Cor 15:25). Furthermore, he always accompanies us from the Tabernacle. Then Christ will come as Supreme and Merciful Judge to judge the living and the dead. This is the universal judgment, when the secrets of each one’s heart will be revealed, along with each person’s conduct towards God and neighbor. This judgment will confirm the sentence each person received at death. All men and women, according to their deeds, will be filled with life, or condemned for eternity. Thus will the Kingdom of God be consummated, that God may be everything to every one (1 Cor 15:28). 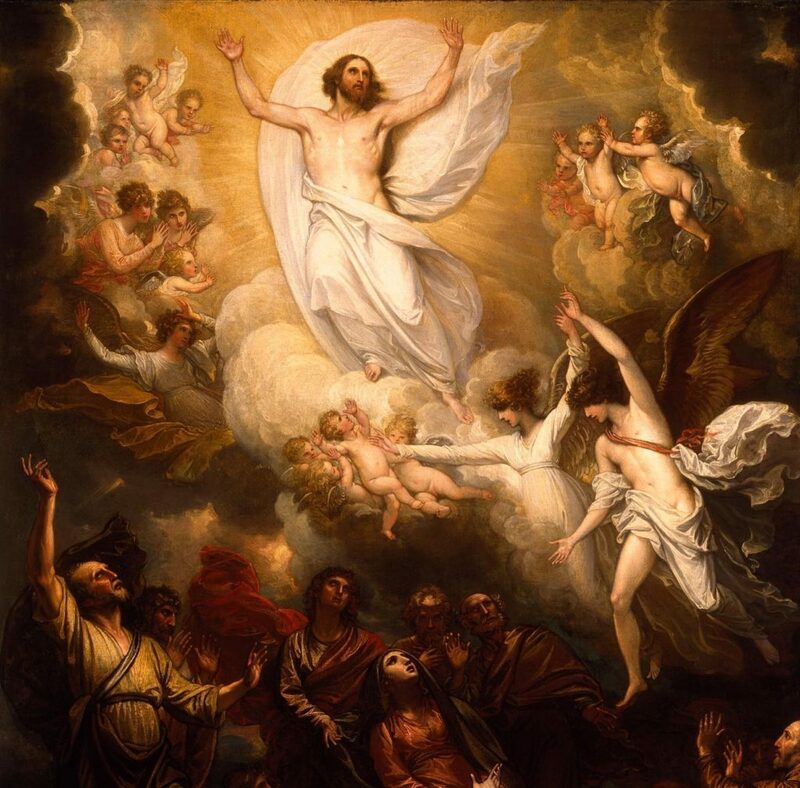 St. Josemaria, Homily “The Ascension of our Lord,” in Christ Is Passing By , 117-126. A PRAYER FOR ALL MOTHERS: HAPPY MOTHER’S DAY TO ALL MOMS IN THE WORLD! Of all of the miracles described in the Bible, I find the miracle of the Ascension to be the most confusing one. During the First century AD almost everyone thought that the Earth was the center of the universe, as Aristotle had also assumed several hundred years earlier. Today we know the earth is one of hundreds of billions of planets, and, that there are hundreds of millions of galaxies. As science advances we know more and more about the universe and how incredibly tiny the Earth is in relation to the rest of the universe. Now, also keep in mind that in 1999 Pope John Paul II issued a pronouncement that heaven is NOT a “PHYSICAL PLACE”. It is a state of being. Ok, so how then does the Catholic Church interpret the Ascension today? Since Pope John Paul II indicated that heaven is not a physical place/location, then was it Christ’s spirit that ascended into a heaven that is immaterial/spiritual? If so, does that mean his body was buried here on earth? If not, then please square this circle for me and explain the current position of the Catholic Church on the Ascension. I believe in the message of Christianity. I think the message is what’s most important. But please help me out on understanding my basic question here about the Ascension.